As I’ve previously written, I had high hopes for the 2016 MacGyver reboot. Unfortunately, where the original show was clever and somewhat educational, the new show simply condenses most of the “MacGyverisms” in to MacGuffinisms, omitting the science, process, and sometimes, even the basic concepts involved. I’ve been meaning to write an analysis of how poorly the show depicts science and technology, especially computers and computing, and about how half of the crap he builds, simply wouldn’t work. However, when I watched S3:E9 “Specimen 234 + PAPR + Outbreak”, I saw something so egregious that I couldn’t let it pass without comment. Having written about bomb myths and cliches, it was difficult to see past the flaws in the opening scene of this episode. Mac makes the statement that it would be too difficult to pick the lock without triggering the bomb. First impression: Except for the fake “logic board”, which really appears to be some sort of analog IO controller, the bomb appears to be extremely low-tech. There are no (visible) motion triggers, no collapsing circuits, and no false leads. You could probably remove the “logic board” and simply direct-wire all of the other components. You might need a relay if the trigger circuit is normally-closed, and you might need a capacitor to boost the detonating current. With no visible antenna wire, and knowing that the steel cage probably interferes with a radio signal, there is probably no remote trigger. The MacGuffin board is obviously fake. 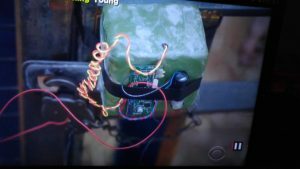 Aside from the fact that there are data connectors in the lower-left and upper-right edges, the traces on the board itself are too small and fragile to carry a current that would be capable of detonating the blasting cap. Instead, the traces on the board would simply vaporize when triggered. Further, there appear to be two logic chips, one of which appears to be an ASIC. I mean… is this a PROGRAMMABLE BOMB??? Does it run “BOMB Operating System”, and at some point, you plan to upgrade to “BOMBOS 2.0”? The so-called trigger is a lever padlock. Ostensibly, if you attempt to manipulate the internal locking system, you either interrupt a circuit, or close one, triggering the bomb. However, lever padlocks are all-metal, and to be clear, the lever-locking mechanism is also metal. So maybe the circuit is normally-open, and perhaps there is a small bit of plastic that will fall out if you fiddle with the lock, allowing a circuit to complete. This is unlikely, as the placement would be tricky, and most likely, the trigger wire would ground out against the lock’s metal body or lever regardless. Moreover, if the circuit is normally-open, you could simply delete the trigger by cutting one of the trigger wires. Maybe the circuit is normally-closed, and fiddling with the lock will cause the trigger wire to disconnect from the lock’s body, triggering the explosion. Again, this would be tough to do without blowing yourself up by just setting the trigger in place. In either case, how is their captor supposed to unlock the cage?? Perhaps he disables the bomb, removes the trigger wires, and THEN unlocks the padlock. All of this is too unnecessarily complicated and unreliable. A better approach would be to use a motion trigger, and perhaps a simple, normally-closed loop of wire around the door and frame of the cage, that acts as a secondary trigger if broken while attempting to open the cage door. 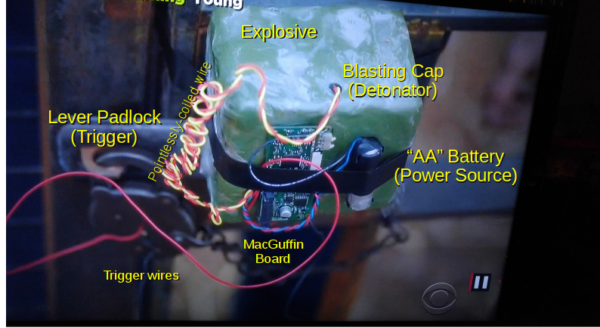 The detonator appears to be a blasting cap, embedded in what appears to be a block of soap. Although the blasting cap appears to be real enough, the “explosive” looks strangely translucent-green. My wife says it looks like gel soap wrapped in cellophane, and she’s probably right. Although they obviously can’t and shouldn’t use real explosive, a little effort to make it look realistic would have been appreciated. The power source appears to be a “AA” battery. If so, it would have insufficient voltage to drive the “logic board”, and insufficient power (current) to detonate the blasting cap. Maybe the battery is supposed to be a lithium battery, like the type used in photography flash bulbs, or a rechargeable such as the 18650. Both of these can deliver higher voltages and / or higher current over a short duration, which would definitely be sufficient to detonate the blasting cap, but would probably fry the logic board. Since MacGyver can’t seem to figure this out, I’ll give him some help. Pull out the blasting cap. Because it’s coiled, there is a nice, long lead wire, which would allow you to position the cap far enough from the explosive, that it wouldn’t respond to the cap detonating. Better yet, put the cap inside the keyhole of the lock, along with a small blob of explosive, and yank the trigger wire in order to blow the lock apart. Cut the blasting cap’s wires. One at a time. Cutting both simultaneously might allow one of the leads to short to ground, which could detonate the cap. Cut the leads from the power source. Cut the negative first, then the positive. This prevents the battery from creating a current surge across the negative terminal, if the positive lead is cut first. Although most devices are switched from the positive lead, if the positive lead is cut first, it leaves the negative lead and the circuit ground in contact with each other. Short the trigger wires across the terminals. This assumes that the circuit is normally-closed, and that there is some voltage flowing through the trigger wire at all times. Conversely, if the trigger is normally-open, simply cut the trigger wires (one at a time, of course). Once the bomb is disarmed, the blasting cap could be used to blow up the lock. Or, they could burn some of the explosive to melt the chain in order to get free, and then rig the rest of the bomb with a tripwire, set to actuate when their captor returns. My new favorite thing is to play the song, “You’re the Best” from”Karate Kid” while Windows Updates are running. Let’s make Windows Updates inspirational again! Guns are a pure expression of physics. In addition to bad gun physics, movies and TV tend to depict handling or firing techniques that wouldn’t work, wouldn’t be effective, or could even be dangerous. Do you need to file a State income tax? Pay $30 more than you planned. In movies, we often see technology myths that get repeated and propagated until they become “common knowledge”. The technology of bombs and bomb-diffusal is no different. Please note: This has NOTHING to do with pizza coupons nor discount codes. If you want pizza coupons, click here. Every now and then, I run across the Geek Code, a compact notation for sharing basic profile and personality information. Could you define a compact yet robust notation for ordering a pizza? Could you order any pizza within an 80-character text message? Could you manage a single order with multiple pizzas within an 80-character text message?